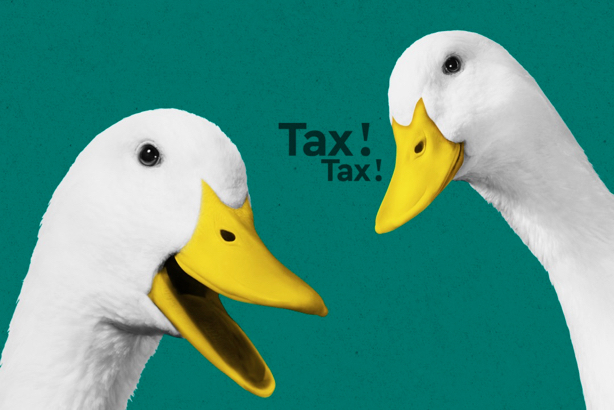 HM Revenue & Customs adopted a humorous, duck-themed approach to its Self-Assessment comms, resulting in one of its most successful years ever to get the self-employed filing their tax returns and paying up on time. The campaign conveyed two basic messages — to remind the self-employed to complete their tax returns and pay any monies owed by 31 January 2018. But it used a tone that was studiedly empathetic, eschewing the sometimes intimidatory voice used by public sector bodies reminding people of their obligations. There are some 11 million people who complete a Self-Assessment tax return and HMRC concentrated its comms on those who do not have an accountant or financial agent. The campaign was split between earned and paid-for comms. While broader PR and customer comms started mid-November, paid-for marketing ran from 26 December to 31 January. HMRC's press office sprung into action ahead of the deadline, gaining press coverage in national and financial titles that attract a high proportion of its target. Meanwhile, the campaign's warmer approach was summed up in the campaign message: "Don't let the thought of your tax return peck away at you. Don't duck it, do it." 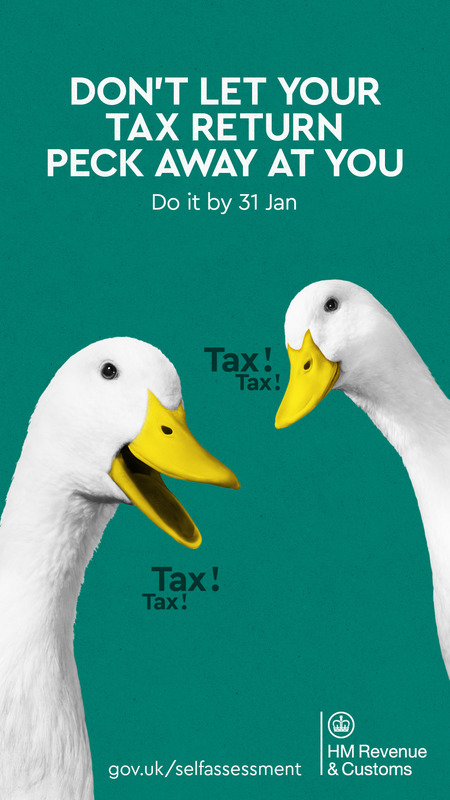 'Quacking' campaign imagery used actual ducks encouraging people to fill in their returns on time. Social played a significant role in comms, with Facebook, Twitter and LinkedIn targeted. HMRC said that Self-Assessment has a number of followers on the latter two channels in particular. Meanwhile, advertising spanned an array of marketing channels, including out-of-home, radio, digital, display, video on demand, search and social media. Previous campaign analysis had demonstrated that these channels resonated with the target audience, performing strongly and cost-effectively. Additionally, from November to January, 6.7 million direct comms were delivered, including emails, SMS and letters. The campaign had its desired effect, with 94 per cent of returns filed on time while 92.5 per cent filed their return online, making 2018 "one of the most successful years for Self-Assessment". Last year's completion figures were 93 per cent and 92 per cent respectively, up from 92 per cent and 89 per cent in January 2016. As a result of the PR drive, articles appeared in the London Evening Standard, Money Mail, The Guardian, The Sun, Financial Times, and The Independent, while BBC Breakfast covered the story. Poli Stuart-Lacey, who was recently appointed director of comms to help build the department's reputation and 'brand persona', said: "The new campaign is bold, creative and draws on extensive insight into what resonates most with our audience. We’re really pleased with the campaign and how it contributed to a record year for Self-Assessment. We’re currently evaluating the campaign to see how the new approach performed, but so far the metrics are looking strong." Accordingly, HMRC is in the process of evaluating the various elements that contributed to the campaign's effectiveness, using what worked and what didn't to shape future campaigns. It said that data and metrics will include qualitative research comparing pre- and post-campaign, channel awareness and media evaluation across all channels, measuring reach, frequency, CTRs (click-though rates) and CPCs (cost per click). Internal data on filing rates, Gov.uk data, social evaluation and press coverage and sentiment will also be analysed. Although HMRC has not yet released official analysis data, social analytics specialist Talkwalker examined how people engaged with the campaign on social. The #selfassessment hashtag was used more than 11,200 times between 1 November and 31 January. Activity peaked on three occasions — with 313 tweets a fortnight prior to the deadline day, when HMRC published a list of excuses given by people for late filing. Other peaks were when the hashtag garnered 571 tweets one week before and 908 tweets on 31 January itself. Talkwalker found that engagement was driven most by three key Twitter accounts — @HMRCgovuk, @HMRCbusiness and @AccountingWEBuk. More men than women used the hashtag (71.3 per cent vs 28.7 per cent respectively). What next after DWP's Valentine's Tweet - a Christmas campaign asking how you can afford presents on benefits?